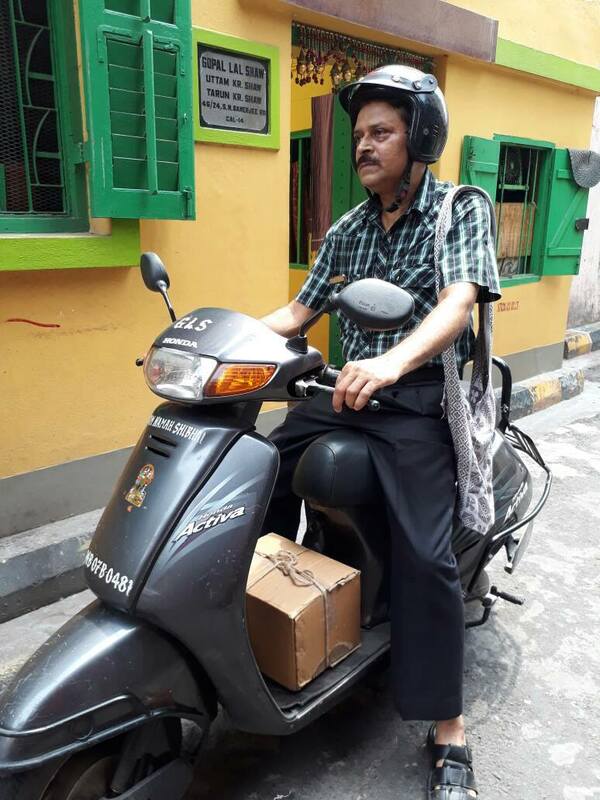 He Has A Mission For Which He Is Found On The Streets Of Kolkata On A Scooter Since the Last 32 Years. This story is of a down to earth man, nobleman, a great father, son, and husband who has a vision and roams on wheels to accomplish it. A Normal summer morning when you can witness adults rushing for work and kids rushing to schools. While one carry newspapers and briefcases, the little ones have a burden of books on their shoulders. Amidst all this, a man goes through the streets of Kolkata, but as he passes by he leaves smiles behind. The faces of people glow in awe of what he has to offer. His name is Tarun Kumar Shaw. Lost in the demands of his clients you can see him working on the list of books in a quiet room colored with the cover of hundreds of books. While some had demanded a magazine, some for a journal and many others asked for some rare classic novel written by an old English author. This man has it all in his head. He begins to call his contacts to get in touch with international booksellers. “Procuring rare books is tough work, but I try my best to fulfill all orders. No one should be stripped of the chance to read a good book,” said Shaw. 34 Years ago, his father started a bookstore called “Dey and Brothers” in Kolkata’s New Market. However, ever since the bookstore was wound up, Shaw has taken up the idea to deliver books on the scooter to every client in the city. This has been going on for 32 years. It’s a long time. “After completing my graduation I didn’t take up a job and involved myself in the family business. I grew up around books, hence, was always inclined toward them,” he said. His home is his warehouse and his workplace and his passion have even overcome challenges for companies like Amazon who find it difficult to reach every nook and corner of the city. The city knows it that when it comes to literature, he is the man that can be trusted. This venture is run by Shaw, his brother and three others who work on the delivery process. “Magazines and journals are guaranteed orders because people usually know what they want. But when it comes to books, they want to read the work of authors they haven’t heard of before. They ask for suggestions and this is when I get involved in long conversations with my clients about books from around the world,” said Shaw. The job of delivering magazines, newspapers, journals was carried on by the three boys hired by him. But when it comes to books, they make sure that it is done by either Shaw and his brother. “Our clients have been with us for years. We talk to them to acquaint ourselves with their interest. Once they place an order, I add a few books on my own based on what I feel they might enjoy. More often than not, they retain 2-3 books,” he said. He has all kinds of literature with him. However, when it comes to rare books, they have to either be second or third hand and in that case the clients are informed about it beforehand. “If the pages are a little torn, or if a few lines are underlined in pen, we tell the customer,” said Shaw. Going back 2-3 years in time, Shaw recalled how the popularity of Kindle and e-books had hampered the business. “However, gradually people are again shifting toward hard books. Any publishing house which introduces a new book survey the area first and puts their books for sale basing on the demand. Even we have many clients who are Kindle users, but they still demand books,” revealed Shaw. His business works on familiarity and trust. “It’s about love for books and giving people the chance to read,” he said. His son is in Singapore and is a computer engineering graduate. “If I wanted profits only, I could have opened a store where people choose the book they want, pay and leave,” he said. “But my business is so much more. Through these years, we have understood the taste of our clients and no one, after us, will be able to take over because they don’t know what our clients want. The Tata Cyrus Mistry case; have a look!